Based on the award winning HBO television series Game of Thrones comes the Game of Thrones Essos 4D Cityscape Puzzle. This puzzle will guide you through the assembly of the map of Essos in a patented multi-layer design. The first layer is a 1000+ pieces jigsaw puzzle that will teach you all about the various locations and regions of Essos. The second layer is an artistic 200+ pieces jigsaw puzzle that replicates the current landscape based on the famous introduction of the television series. The third layer adds the 3D miniature replicas models that you insert into the puzzle, which include famous cities and castles such as Braavos, Pentos, Meereen, Valyria, Astapor and many more! 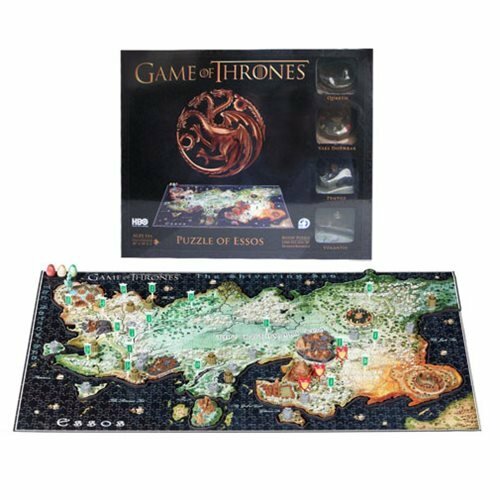 In addition, the puzzle comes with an information booklet that teaches you everything you need to know about Westeros, including over 45 flags to mark famous landmarks, 10 sigils to mark the Houses, and 3 battle markers to learn the locations of three major battles. Bonus items includes a miniature set of the Dragon Eggs. When assembled measures about 30-inches wide x 18-inches long x 2-inches tall. Game of Thrones Essos 4D Cityscape Puzzle incudes 1,350 pieces. Ages 14 and up.